Wii Fit Plus solus is the ultimate upgrade for your Wii Fit and for those who do not have Wii Fit yet they can get all New Wii Fit Plus and as well as experiencing all these features of the original Wii Fit they can get their hands on the all new features. Wii Fit Plus will offer all the features of the first installment and all new features to make your workout more productive, and personal as well as some more great new fun games. 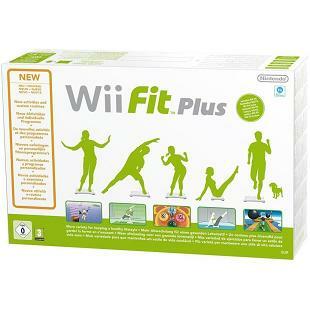 Wii Fit Plus will still enable everyone in the family to combine fitness with fun. Wii Fit Plus offers you even more understanding of your fitness levels and the new workout routines make it even easier to work on those trouble areas of your physique. Wii Fit Plus still offers 3 key areas but each has been expanded to offer you more information about your Physique, all new training programs and additional exercises, as well as additional areas of your fitness to track as a family including the pets! Wii Fit allows 8 people to track progress and monitor performance. This is even easier via the Wii Fit channel which can be added to your Wii menus system, allowing you to monitor your BMI, measure your bodily balance, and calculate your Wii Fit, without inserting the disc. Wii Fit will; track your BMI, Weight, Wii Fit age and how long you have done on your daily. Note: The English version of the instruction manual is contained in the game box, and the European version of the manual is in the balance board box.